Criminal Curiosities – Available on Amazon Kindle. 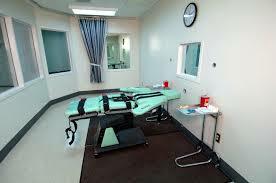 Arizona’s botched execution of Joseph Wood, during which he received a lethal injection that took almost two hours to actually kill him, was the latest in a long, long line of botched executions in the US. The method used is immaterial. All execution methods are evolved with human experimentation, by executioners testing new methods or refining current ones on a trial-and-error basis. If a new method or refinement works then it’s retained. If not, it’s discarded. There’s simply no other way to test new methods or refine existing ones. The British method of hanging evolved from a messy public spectacle lasting hours (as prisoners were taken from Newgate Prison (where the Old Bailey stands today) by cart to Tyburn (near today’s Marble Arch) for public hanging. By the last executions in August, 1964 the process had evolved into a private affair conducted within a prison, with only official witnesses. It took only seconds for a hangman to enter a cell, strap the inmate’s wrists behind their back, walk them a few steps on to the gallows, strap their legs, place the hood over their head and the rope round their neck and drop them to their deaths. The unofficial world record was set by Albert Pierrepoint and assistant Syd Dernley at Strangeways Prison in 1951 when they executed James Inglis in only seven seconds from start to finish. It isn’t about discovering new ways to do the job, or about refining existing ones to the point where they become humane because they never can be. Killing a person after keeping them waiting in a cell for months or years watching the clock tick down and seeing the calendar days crossed off, getting ever closer to the date with a big red circle round it, can never be considered humane. New methods and refining existing ones might make it less inhumane, but it can’t be humane in the conventional sense of the word. It just can’t, and it’s dishonest to suggest that it can. Next Next post: Trial Watchers – A Strange Breed. On This Day in 1977 - Hamida Djandoubi, last man to face a French guillotine. Papillon - The Butterfly Pinned..? Death on Wheels - Mississippi's Travelling Executioner. Devil's Island - Colony of the condemned. On This Day in 1953 - France's last inmates return from Devil's Island. On This Day in 1962: Illinois bids farewell to Old Sparky (and James Dukes). Crime Scribe Powered by WordPress.com.